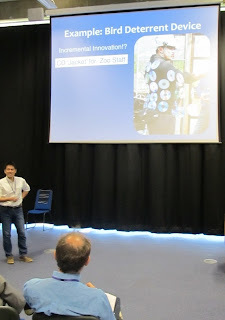 After 2½ days at #oui2013 at the University of Brighton, user innovation (and a few open innovation) researchers have scattered to the wind. It’s hard to summarize 52 hours in one post, but I’ll give it a try. The location was great, host Steve Flowers was very gracious, and it was quite handy to be across the motorway from the SPRU thought leaders. What did I learn? I learned quite a bit about being at the beach on a summer weekend near London, and also how expensive it is to host 140 people (or 200 for the US workshops) with all meals for three days. I learned a lot about my own work on firm external collaborations (more in another post). Here is Flowers’ word cloud from the ~100 paper titles. (To keep things in proportion, the cloud omits “innovation” and the abstract word cloud omits “von Hippel”). Below are random thoughts about what I learned about UI topics; apologies to any of the presenters if I mangled the story from their talks. I've also excerpted from a few of about 80 photos of the conference, which I have posted for general viewing on Picasa. One of the big topics at the conference is what happens after users innovate. Diffusion of such innovations was a major focus of the talk by Jeroen de Jong, a self-described “part of Eric’s mercenary army.” He started out with the amusing video by Martin Aslander, who created a wooden iPad stand that was featured in Wired and then got an explosion of interest on their website. Based on a large-scale survey in Finland, users disseminate only 19% of their innovations. One reason users might not share their innovations is that they’re too narrow or individualistic to be value for other users; in the Finnish survey, 85% of these innovations are thought (by the inventor) to be of general value. Of these 85%, 22% were diffused: 6% by transfer to commercial firms, and 16% via peer-to-peer diffusion. De Jong’s approach is an important step forward in defining the impact of user innovation, and I hope this classification approach will take root. In a minitalk Wednesday, Christoph Stockstrom of TUHH looked at a particular example of user innovation in services — surgical procedures. As we know from previous work, user innovation is common by healthcare providers, but how does it diffuse? Yes, the attitude of the user innovator has a big impact on diffusion, but what’s also crucial is the involvement of the initial round of early adopters, who (for medical innovations) become trainers to interpret and diffuse the innovation to others. On the final day Wednesday, there were a lot of interesting 2-minute minitalks — too many to follow up by attending the full talk. While I decided to focus on people (and work) that I know, several talks seemed worthy of mentioning. Two of these minitalks were from Japan. The most fun minitalk all day was by Manabu Mizuno of Hannan University. The example he showed was of a “bird deterrent device” (think 21st century scarecrow), based on people hanging used CDs. (From prior bird deterrent efforts, I assume the reflections off the CD scare the birds away). It was a very simple user invention, but Mizuno asked: how would you commercialize it? First, can a simple hanging CD be turned into a real product, such as a vest of hanging CDs? Secondly, if it’s such a simple idea — that can’t be patented and can’t be kept a secret — how can firms appropriate the returns of such innovation, and if not, how will the innovation be diffused? Another Japan-oriented talk was by Peter Svensson and colleagues. He talked about how — after Fukushima — citizens and scientists self-organized to improvise low-cost real-time radiation measurement equipment. Instead of waiting for commercial equipment to be developed, the urgency of monitoring radiation levels for public health prompted volunteers to adapt technologies to solve the problem at hand. 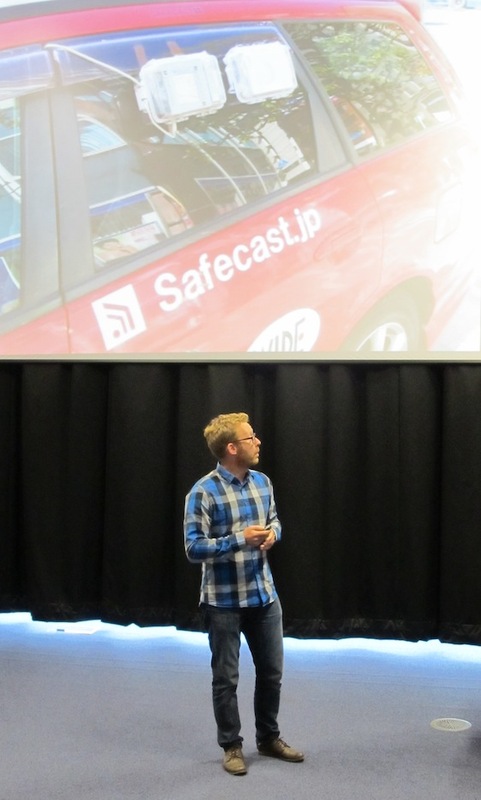 To me, the Safecast.jp network provides a fascinating example of a) how an exogenous shock stimulated concerted user innovation and b) how the network self-organized to harness that enthusiasm. This seems like a wonderful example of a research design that allows us to study the early phase of coordination in user innovation communities. The opening plenary talk by Nik Franke Tuesday asked “Are users really Spocks?” summarizing his 2010, 2010 and 2013 JPIM articles and 2013 Org Science. The graphical illustrations (using the Star Trek character) brought several rounds of laughter, but unfortunately from my vantage point I couldn’t get a good picture. If I understood the argument, it was there are more reasons why users innovation (and share innovations) than just for the personal “functional benefit.” One reason is a sense of accomplishment; this is old hat to open source researchers, and also something (from two 2010 JPIM articles ) Nik mentioned in his plenary in Vienna two years ago. Franke also had my favorite title of the conference, “Does God play dice?” After doing a study with a €50,000 prize to find optimal solutions, Franke and colleagues then did a random sampling of a subset of the participants to see what the results would have been if everyone had not participated. It turns out that 22 factors that predict community success explained 11% of the variance — while the community size (# of participants from the draw) explained 60% of the variance. This both confirms what we know about the importance of attracting participation — and also (as Franke noted) is a humbling chastening for our attempts to ascribe success to causal mechanisms.